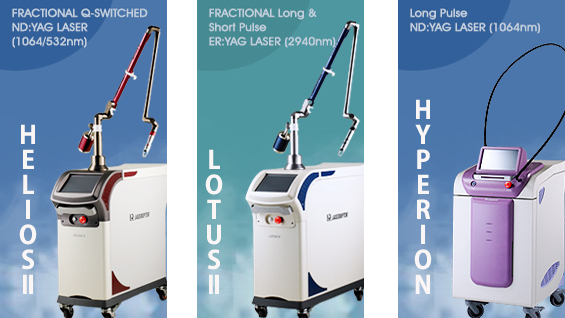 This article addresses the types of laser for pigmented lesion and tattoo removal, and the efficacy and safety of each laser. For a pigmented lesion, the main objective of treatment is to damage the abnormal pigments and sparing natural or normal skin color to achieve an overall even skin tone. Chromophores are divided into two types; melanin inherent in the skin and externally injected dye. As described in “#4. Lasers and Soft Tissue Interaction ‖”, the pulse duration of laser should be shorter than the thermal relaxation time of the chromophore, and for this, Q-switching laser should be used. Q-switching laser can project laser beams within 10-8 seconds of pulse duration, which is shorter than the thermal relaxation time of the chromophore, thereby minimizing thermal injury to the surrounding tissue. The high peak power is capable of reducing chromophores to the smallest size, which is the best treatment outcome for a pigmented lesion. The peak power is directly proportional to the power output and inversely proportional to the pulse duration; thus the peak power increases with a shorter pulse duration when the power output is the same. Increased peak power of the laser projected onto the skin is capable of breaking the chromophores to less than 10˜̄⁶m, facilitating their release through the immune/lymphatic system. When the peak power is too high, it can damage the epithelial layer while being absorbed in the pigments in the epidermis, thereby causing pain as well as post inflammatory hyperpigmentation (PIH) and scar. The thermal injury should be reduced by cooling the epithelium. Now, let’s discuss the thermal relaxation time, the most important concept in thermal injury. The most important concept for medical lasers is ‘selective photothermolysis’ proposed by Anderson and Parrish in 1983. This is a concept of inflicting minimal heat injury to normal surrounding tissues by selectively damaging target chromophores. This means that chromophores absorb relatively different degrees of light and does not guarantee 100% complete selectivity. In this equation, r refers to the radius [m] of a target tissue, and D refers to thermal diffusivity [m²/s]. Thus, thermal injury can be minimized when the pulse duration is shorter than the TR of the target tissue. For example, as the primary component of human body, water has a high absorption coefficient of about 230cm-1 for a CO2 laser wavelength. When TR is 320us, carbon dioxide laser projected within 320us will be absorbed by water inside the target tissue, without inflicting a thermal injury to the surrounding tissue. If TR is beyond 320us, however, the heat can be transferred to the surrounding tissue, causing unwanted thermal injury. Thermal relaxation time is variable depending on the type and size of chromophore, as listed <Table 11-1>. The laser irradiation time should be shorter than this so as not to inflict a thermal injury to the surrounding tissue. For the selective photothermolysis to be effective, the target tissue needs to have a high light absorption coefficient compared to the surrounding tissue, and a laser with a shorter pulse duration than the thermal relaxation time of the target tissue should be selected. In general, the thermal relaxation time is less than 1ms for soft tissue. Therefore, when treating a pigmented lesions, a very short pulse duration should be used to not inflict a thermal injury to the surrounding tissue and a high output laser should be used to break down the chromophores to the minimum size. Now, let’s take a look at the types of lasers currently available for pigmented lesion treatment and their advantages and disadvantages.